Invest in your comfort by choosing the most comfortable and ergonomic saddle from Greensen. It will transform your painful riding experiences into fun and comfortable cycling adventures. Due to the thick & soft foam padding and the dual spring suspensions, our Oversize Saddle will distribute all the pressure from your behind across the surface of the saddle and will help you avoid lower back pain. 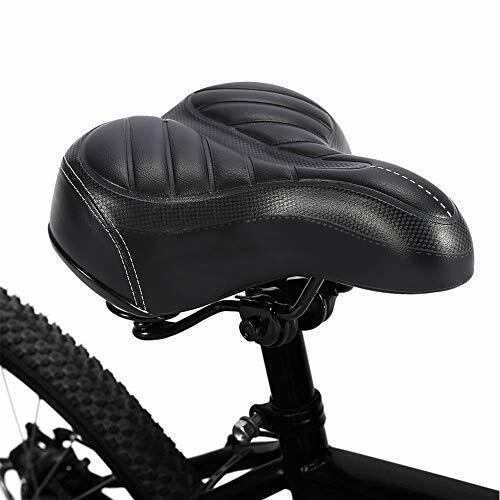 ★GET A COMFORTABLE BIKE SADDLE - With thick bike seat padding and dual spring suspension, Our padded bike seat will help you stay away from pain when used as a stationary bike seat or as an outdoor padded bicycle seat. So there is no need to worry about your money will be wasted. ★SOFT & COMFORTABLE: Dual Shock absorbing ball Designed,Using double Shock absorbing ball in the bottom of cushion , good elasticity, toughness, larger endurance, flexibility, and easy to deal with rough terrain. Surface microfiber artificial leather is of wear resistant, smooth and anti-scratch. ★Ergonomic Design - The front part is smooth and a half inch narrower than normal bicycle seat, so it will not rub or bind on your thighs. With "horn" on the saddle can keep you from sliding forward. It will distribute the pressure on the cycling bike seat and allow you to ride without pain. ★EASY TO MOUNT & UNIVERSAL FIT - This ergonomic bike seat upgrades ride quality for most bikes but it's best to use it on cruiser, mountain bikes, road city bikes, fixed gear and touring. Greensen dual spring saddle has a standard rails mount system. ★Money Back Guarantee - We want you to love our products. If our oversize bike saddles does not improve your comfort, please contact us and we will refund you the money. With that, you have no risk.